I love wedding invitations! A wedding invitation sets the tone of a couple’s wedding and allows guests to envision the big day. And what better way to do so, then with affordable, unique and high-end designs from our sponsor A Printable Press . A Printable Press was created as an alternative to expensive stationery, but also as an alternative to the totally-from-scratch, do-it-yourself approach. Along with offering affordable printed cards on thick eco-friendly paper, they also offer customized print-ready files. These files can be taken anywhere—a copy shop, at home, with a professional printer, online, and some can even be letterpressed. Professional invitations designed to suit any budget and bride! A Printable Press’s motto is “everyone deserves good design” and as such, they want to share with two Once Wed readers $250 worth of wedding stationary! To enter to win, leave a comment at the end of the post. Make sure you check our their site to see all their design goodies. I love A Printable Press! I love the Garland Invitation for our winter wedding, but also swoon when I see the beautiful scripted sets. Lovely. Entering on behalf of my bestie! I would love to win the gift certificate for the wedding stationary! Printable Press’ designs are flawless! I especially love the Twining Vines invitation in the Botanical category. Thanks! What a great gift this would be! 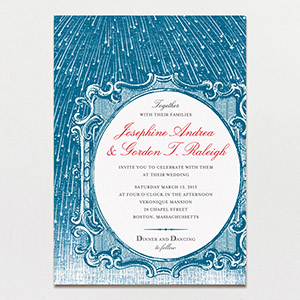 A Printable Press has gorgeous designs that will work perfectly with my upcoming wedding. LOVE LOVE LOVE these invitations, would LOVE to win! Good design is good – I love their look! I love the “amor” invitation! The details of the printed red lace is incredible. Printable Press has amazing designs! I would love to win this gift for our upcoming wedding! Oh, how wonderful would it be to win these! They are so beautiful. Thank you for sharing! I just sent in my order for Save the Dates from A Printable Press! They are great to work with! This would be so amazing to win! Crossing my fingers! Amazing work! I would love to win a gift certificate for your lovely designs! What a lovely give-away! Would love to win this!!! Absolutely beautiful designs. This would totally make the difference between me making my own invitations at home and having a more polished look from Printable Press. Fingers crossed, I love all of these! This is great! Would love to have these invitations! Love these! They’re flawless! Not surprising that I’d love to win this. Thanks Once Wed! What a great idea! I love that you have the option of printing it yourself or having them print it for you! 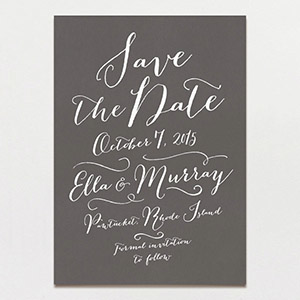 PrintablePress is my favorite wedding invitation website! I have it in my favorites, and I was planning on using it anyway! Yay for personalized PDF’s! WOW! How great is this?! I am getting married in September and have been scouring different websites to find affordable and beautiful Save the Dates! Even if I don’t win, I think I found my Save the Dates here! Love it! So modern and classy – especially love the blue and poppy red together! Such a great way to communicate aesthetic with only great font and simple illustration. Amazing competition! I wish I was getting married, I’d definitely enter for the second design! Beautiful stuff! Beautiful and fun invites! 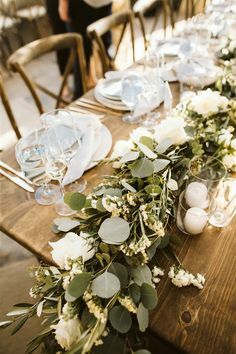 I don’t know what I would do without you guys, I have found so many great wedding ideas here…this is just another! Wow! I love the one at the top. I’m going to the site now to check them out. Hopefully I win! Beautiful designs. Would love to enter to win this terrific giveaway! I am in love with the Printable Press! The Pen&Ink collection is my favorite, although it is so hard to choose. Thanks OW for showcasing such great talent. I <3 The "Fun Destination Invitation." I also love that they share wording advice for wedding invites. So helpful and sweet! This is a fantastic idea. So many great options! Such cute designs! I especially love the tandem bicycle invite. I love the first chalkboard inspired one! Beautiful! I’ve been stalking their site for months! I’ve been pining after the woodcut invitations for months now but our stationary budget is basically zero dollars. Winning this would be amazing! These invitations are so beautiful and creative! I would love to win these for my wedding in September! Love this site, love the idea and would love to win! Oh, I would love to win this! I have been pining over the Lush Bouquet Invitation for months! We are in the midst of picking out invitations and have been drooling over your designs. Would LOVE to win! I’m obsessed with these invitations ! I love all of the different fonts Printable Press uses. Very unique, yet still very on trend. Hope I win!! Wow, these invitations are some of the most unique and fun ones I’ve seen so far! I’d love to win!! I LOVE the chalkboard and birch bark invites—and would particularly love to win, as winning such lovely invitations would be a remarkably good omen at this point—the DF and I have fallen on some hard times and are trying to avoid canceling our May wedding altogether. Thank you for this amazing contest! Oh,I love a Printable Press! The fonts and designs are to die for and would make the perfect addition to our beachside wedding in Charleston, SC! I love the “Modern Calligraphy” invitation for my wedding! I have never heard of printable press but once I saw this post I checked it out and ended up really liking it! Thanks! I adore their designs! Still piling the perfect one for our September wedding. The by the shore invites would be absolutely perfect for my daughter’s Chesapeake Bay wedding! Wow, I just love it all! I would be so excited to win! There are so many great designs, I would struggle to pick my favorite. What a great giveaway! I would absolutely love to win the $250! I just adore them! Such creative design! Would love to win this! Stunningly simple – who doesn’t love gorgeous script? would be so psyched to win! I love it — it’s so refreshing to see great design made available to the masses for a reasonable price. these are amazing. would be so happy to win! These are fantastic. It’d be incredible to have one less thing to pay for with our upcoming wedding! I love their invitations! It would be wonderful to be able to use them for my wedding invitations in July 2013!! Love these invitations! This is just what I’ve been looking for! 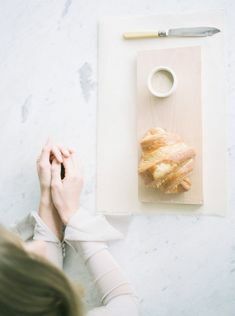 I love A Printable Press’ idea of in between DIY and expensive. What a great alternative for those who want a an inexpensive, quick, beautiful print. Oh wow!Great design choices and love having both options to print ourselves or get it pre-printed! I’ve worked with A Printable Press before and LOVE them! They have the best designs and customer service! I love their designs, so many unique, fun stationary! I would LOVE to use one of their designs for my invitations. 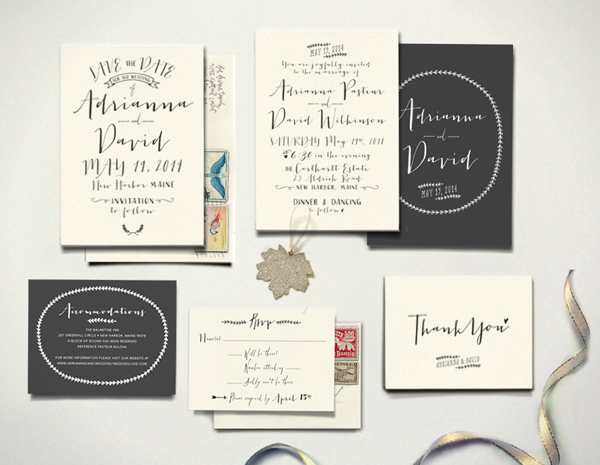 I absolutely love the pen and ink invitations; they’re simple, classic and elegant. I also love the vintage glamour invitation style! It would be so hard to choose a set! I’d love to win a gift certificate! What a cool company! Beautiful stuff. I love the multiple printing options. I love A Printable Press — have been obsessed with their designs since I found out about them and would be ecstatic to win anything from them! Thank you for posting this! I am in the market for Save the Dates right now, and their designs are fabulous! 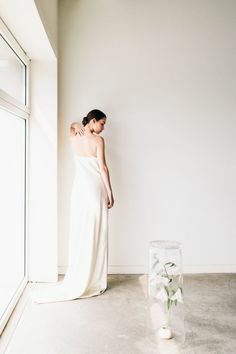 Beautiful designs! I would be honored to be able to send these to my guests. Wow – I was just looking at the “Sweet Mix” invitations this morning! Wow, wow! These are just gorgeous! We’re planning our wedding right now and looking at invitations! Exactly what I’ve been looking for.. It’s a win win situation because I think A Printable Press will get my business whether I’m the lucky one or not! 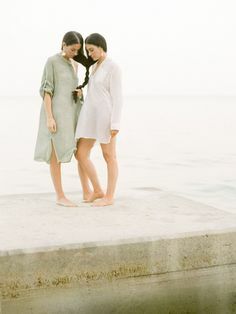 Beautiful and affordable designs! I love the whimsical scripts! I love your unique and fun designs. This is exactly what I’m thinking for invites for my wedding in Aug 2013! How fabulous would that be… Beautiful invites to send to our guest and that I wouldn’t have to make. The idea of making my own invites sounded charming at first but the wedding to-do list has added up quickly. I would love nothing more then to choose a dream suite from A Printable Press to send out! Thank you for the opportunity! I absolutely love this work! Would love to be able to win for our October wedding! 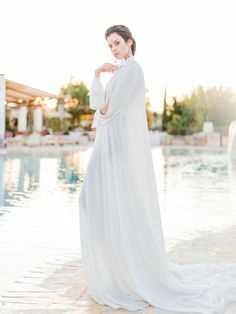 My sister is getting married this fall and this so so her style! She is looking into graphic designers right now, and I will definitely show her this… Hopefully win for her too!! Love your stuff and thank you once wed for sharing! Gorgeous stationery! I’m in love. 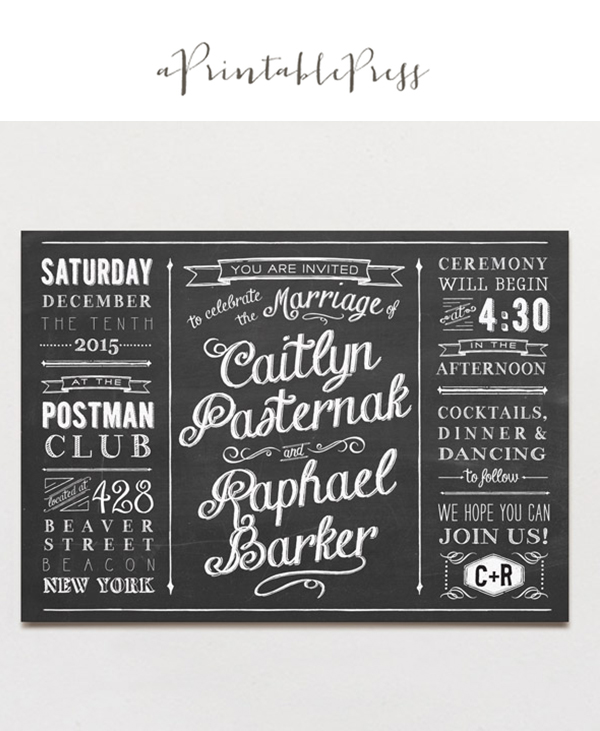 I like the background that resembles a chalkboard – really cool effect for wedding stationary! I love all these invitations! Thank you Once Wed for this opportunity :)! Love the font on these. Would love to win! I love the sweet mix invitation! Entering on behalf of my cousin-in-law. I love fonts and colors and everything! I’d love to win this for her!! I am so in love with these, breath-taking. Here is to hoping! The invites are so lovely! Thanks for the giveaway! Working with you right now…your designs are amazing but what is even better is you are fantastic to work with. The calligraphy is like none other. Very unique! hand lettering and chalkboard style – love it! Would LOVE my invitations done by A Printable Press! Super Cute!! Still elegant and classy. The calligraphy is gorgeous!!!! 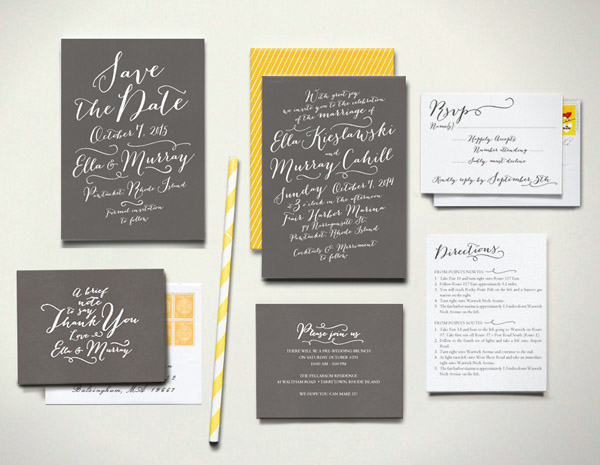 We are blown away by the modern calligraphy invitation, the sweet mix invitation and chalkboard love invitation! We would love love love to win this giveaway!!! Printable Press was a vendor I knew I wanted to work with early on in the wedding planning process. Have had their website bookmarked. Love their designs! I am a paper nerd, a champagne paper lover on a beer budget. I would LOVE this. love these designs!! would love to do a letterpress set! I would love to win! 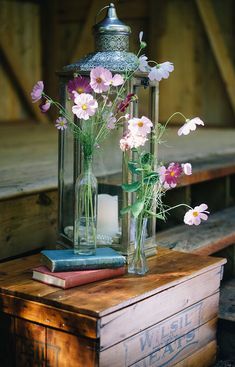 Looking for the perfect invitations for my May wedding! Love these invites and designs! This would be so exciting to win! i love their use of “modern calligraphy”. such a fresh take on a classic art form! i would LOVE these for our wedding! there are so many designs that fit with our aesthetic.